Learn Exciting Cirque Acrobatic Disciplines! Club Med, the brand that pioneered the all-inclusive concept over 60 years ago, and Cirque du Soleil, which reinvented circus arts and reshaped it into a ground- breaking entertainment company, have partnered to launch a completely new and unique concept in experiential travel with Club Med CREACTIVE by Cirque du Soleil. 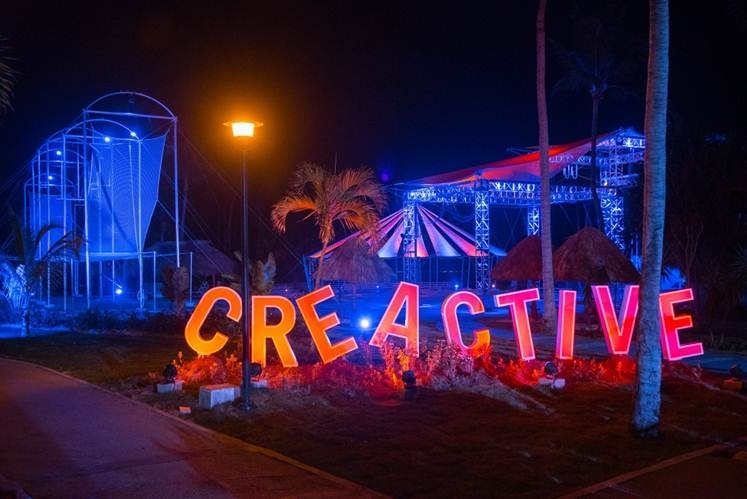 The CREACTIVE concept made its debut at Club Med Punta Cana in the Dominican Republic in June 2015, where guests are able to learn many of the exciting acrobatic disciplines showcased in famed Cirque productions. Circus has been a part of Club Med since 1983, but now Club Med has partnered with Cirque du Soleil to create a one-of-a-kind circus experience that is unlike anything you've ever seen before. 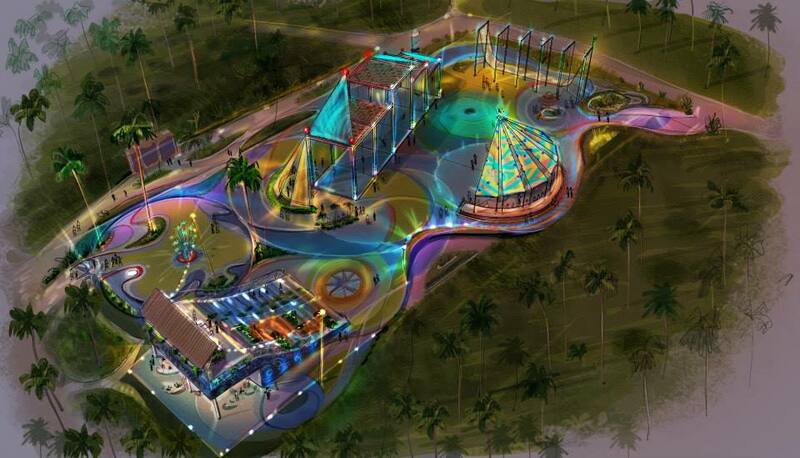 Adults and children alike are invited to live a one-of-a-kind immersive experience in Punta Cana, featuring unique activities inspired by the wondrous and unexpected world of Cirque du Soleil. From artistic to acrobatic activities, vacationers will have fun, learn new skills and achieve things they would never have expected / discover capabilities they would never have imagined! 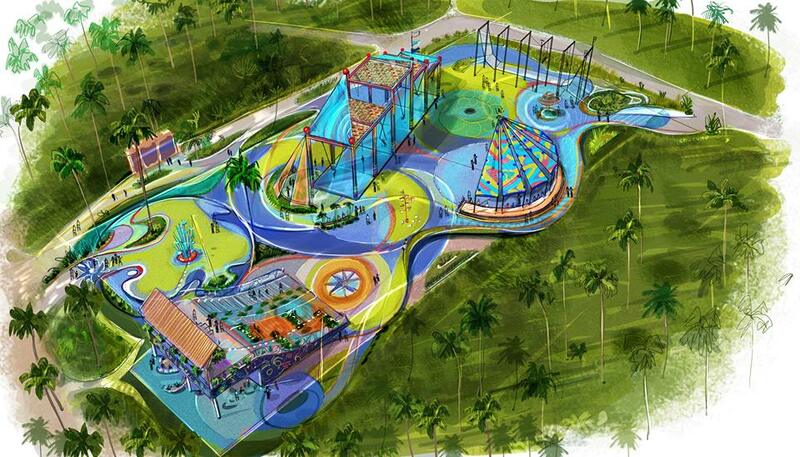 Today about 50% of Club Med's all-inclusive sun resorts offer a circus school. An estimated 240,000 people try the flying trapeze at Club Med resorts each year, with help from our nearly 115 expert instructors worldwide. The CREACTIVE experience invites vacationers to participate in a variety of recreational circus acrobatic and artistic activities ranging from high bungee, flying trapeze, aerial silk, tightrope and trampoline to juggling, percussion, cerceau and dance or mask painting, amongst many others. Guests are fully immersed in a fantastically colorful and imaginative environment that is custom designed to encourage both adults and children alike to learn new skills, play and have fun under the supervision of Cirque du Soleil trained staff, which will help them progress and discover unexpected new abilities! 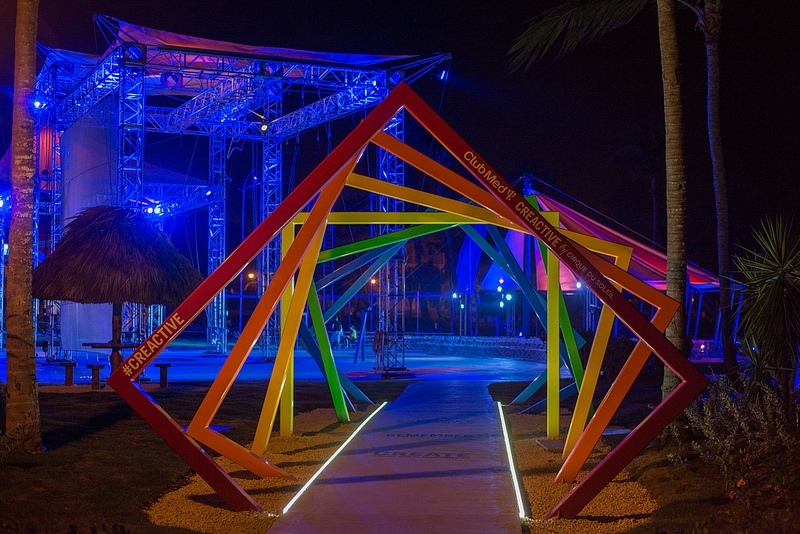 Over 30 of Cirque du Soleil's best and brightest contributed to the construction of the magical CREACTIVE site, including acrobatic performance designers, artistic experts, equipment production, safety and operations specialists, engineers, a human resources team, and project managers. 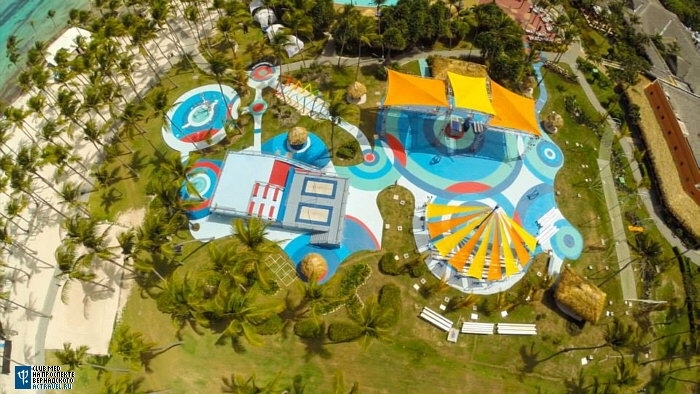 The Creactive Playscape at Punta Cana, which takes up 37,500 square feet (or 3,480 square meters), is under the expert supervision of dedicated "Gentil Circassiens", with 2-3 times the amount of trainers at other resorts with circus activities. The activities are inspired by some 20 Cirque du Soleil productions presented in permanent or touring locations in the world. 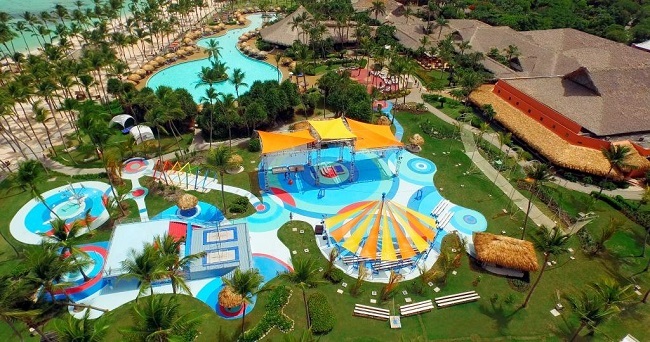 A total of up to 30 artistic and acrobatic activities are offered and will vary according to age group and seasonality. 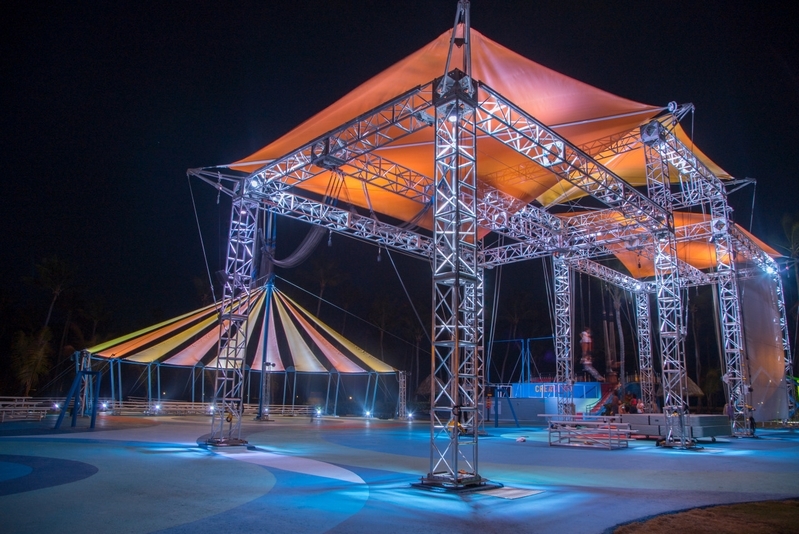 THE GRAND TRAPEZE — a 108.3 feet / 33 meters of aluminum. That's the length of a blue whale! A normal single trapeze is 65.6 feet / 20 meters. LA PISTE — dedicated to a body-sized Germa wheel for spins and flips, unicycle, and stilt walking. THE BIG TOP — houses mini trampolines, rola bola, and other balancing acts, diabolo throws and catches, rumbling, devil sticks, twirling, jugging, tight wire walking, and more. L'ATELIER — a space where creativity comes to life through dance, physical theater, percussion, trampoline, and face painting. 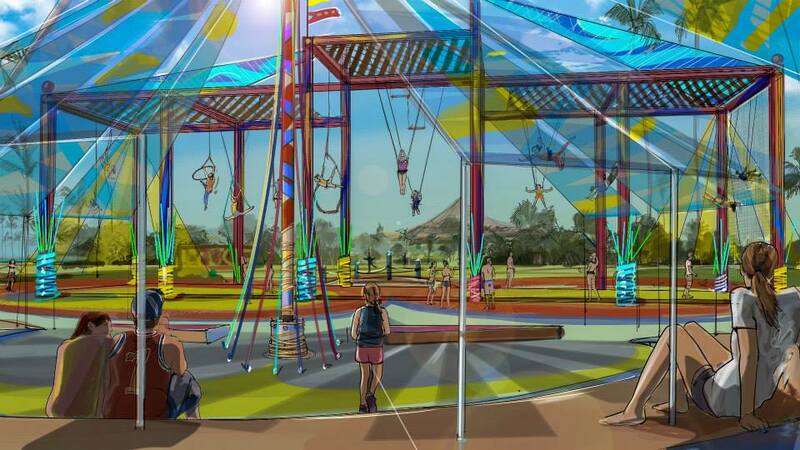 THE ACROPLEX — Offers multidisciplinary acrobatic training such as the Spanish Web, a vertical wall, hoops, bungee, and contemporary aerial dance. The Acroplex is made from aluminum and is 20 feet wide, 80 feet long, and 30 feet high. There's as much space as 272 elephants!